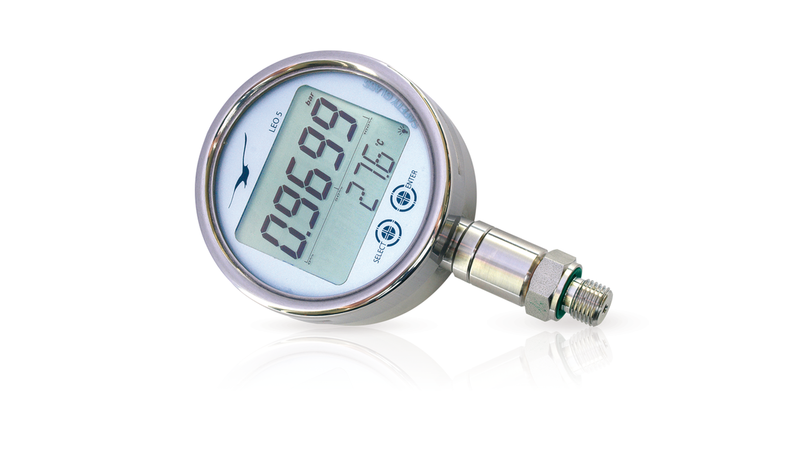 The LEO 5 combines the notable features of Keller’s successful LEO-Record and LEX 1 digital pressure gauges, featuring an IP66-rated stainless steel enclosure. This robust housing combines contemporary microcontroller-based electronics and capacitive-touch controls, operated through the environmentally-sealed safety glass front panel. The large backlit LCD display ensures readability in any lighting conditions. Two selectable measurement modes, standard and peak, are included to ensure maximum versatility. In standard mode, high-resolution pressure measurements are taken twice per second. When operating in peak mode, sampling frequency increases to 5 kHz with 16 bit resolution. The LEO 5 interfaces with a PC via USB connectivity, allowing access to active measurements and recorded data including pressure, peak pressure, temperature, and measurement interval. PC connection also allows device configuration, firmware updates, and recharging of the integral accumulator power supply. The unique modular design of the LEO 5 makes possible adaptation to customer-specific measuring requirements.